What a day, most of the time the storm was raging outside, lightnings, thunderstorms, a hale, even a tornado warning! It was quite an experience! 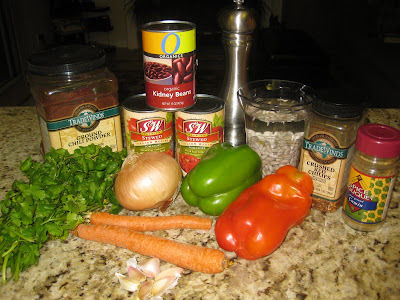 I felt we needed something hot and spicy for dinner, something to match the stormy weather today. 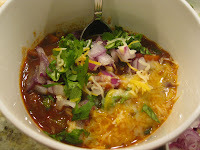 After a quick inventory in my slimming pantry ( remember, I'm still not buying groceries,) it struck me, of course it's gotta be chili. Eureka! and the spices, ground chili powder, chili pepper flakes, cumin and freshly ground black pepper. 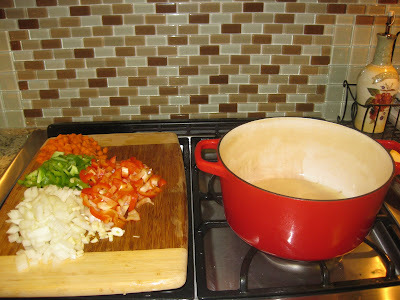 I quickly chopped the veggies and heated two tbsp of olive oil in a pot. First, I added the onions and garlic. Sauted them for few minutes till they became soft. 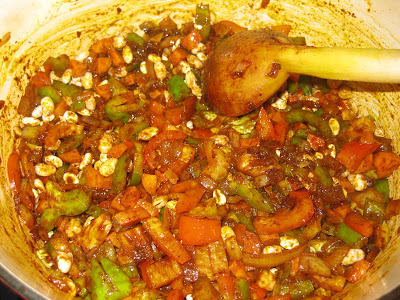 Then I added the spices, black pepper, chili powder, cumin, red hot peper flakes. 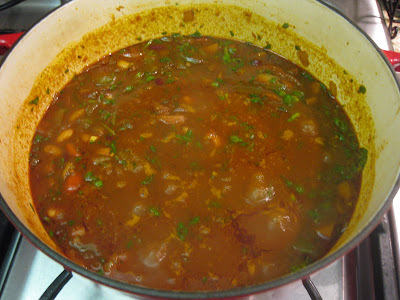 I did not add salt, the beans were not pre-cooked and the salt would've slowed down the cooking process. I added the tomatoes, and cooked for almost 2 hours. 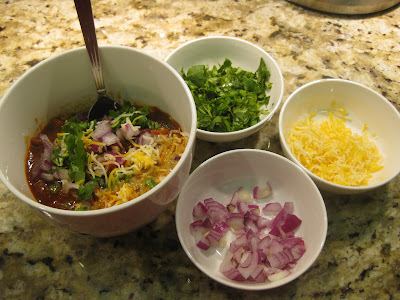 Here you go, spicy chili, with red onions, cilantro and cheese. Perfecto! Now, time to curl on the sofa, and watch the recording of "Private Prictice" from last week :).